The Better Skin Company is happy to announce that their MIRAKLE CREAM (“Genius in a Jar”) is now available at UrbanOutfitters.com. 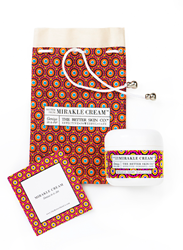 The Better Skin Company is happy to announce that their Better Skin MIRAKLE CREAM (“Genius in a Jar”) is now available at UrbanOutfitters.com. Better Skin Mirakle Cream is the secret recipe of Natalya Rachkova, an Uzbekistanian aesthetician with 27 years experience, and beauty executive Murphy Bishop, II (from butter LONDON and Stila). With the perfect blend of nature and science, Mirakle Cream is a one-stop, skin-saving, problem-solving, all purpose cream with over 25 benefits and counting. Increased hydration, decrease in hyper pigmentation, calming of eczema, toned skin and improved collagen production are to be expected. "As a brand, our goal is to surround ourselves with other innovative brands in non-traditional environments that reach our customer,” says Bishop, II. "Urban Outfitters is this environment. They cater to the fast, fashionable consumer who wants quality, value and results. We are thrilled to be part of their well-curated family." This collaboration has quickly proven successful; Within two weeks of being added to UrbanOutfitters.com, Better Skin Mirakle Cream completely sold out. They are currently restocked and available on the Urban Outfitter’s site for purchase. Better Skin Mirakle Cream’s antioxidant-rich recipe is handcrafted in the U.S.A. with natural ingredients such as beeswax, coconut oil, sea buckthorn, shea butter, cocoa butter, aloe and soothing algae to help moisturize, soften, balance and brighten skin. It helps calm skin while protecting skin’s moisture barrier and fighting signs of aging. Peptides and hyaluronic acid help skin appear smoother, more youthful and radiant. Better Skin Mirakle Cream is free of gluten, parabens, fragrances, and safe for all skin types. Since launching January 2016, Mirakle Cream has quickly turned into an “under-the-radar Hollywood hit, loved by influencers and celebrity makeup artists including Niki Metz and Katie Jane Hughes. TheFashionSpot wrote, “It’s rich enough for the driest skin types, yet it feels light when you apply it." The Better Skin Company’s Mirakle Cream retails for $34/1.7 oz. For more information, visit http://www.TheBetterSkinCo.com. In search of the American dream, Natalya Rachkova and her family emigrated from The Republic of Uzbekistan to Seattle, WA. Tucked away carefully with her most prized possessions was her secret recipe for her famous miracle cream. In the spirit of new and never-ending possibilities, Natalya quickly revived her aesthetician practice and once again began making this “magic” cream in her kitchen. As fate would have it, just as in the old country, word of mouth soon had clients and their friends lining up for this healing wonder potion that provided a youthful glow and appeared to reverse and slow the signs of aging. Some clients reported that rosacea and eczema became calm and age spots began to diminish. In 2013, Natalya met beauty industry alum Murphy D. Bishop, II. Murphy noticed the mysterious pot of cream cooling in the kitchen and was captivated by Natalya’s passion for her elixir. In the short time he was visiting, the number of people who came by the house to buy her cream astounded him. He tried the cream and immediately fell in love. Murphy convinced Natalya to allow him to take her precious recipe to chemists in hopes of scaling up the small-batch, home-brewed cream to meet the growing demand. The chemists succeeded. They remained true to Natalya’s formula and added a bit of modern science to further enhance this “genius in a jar” now known as Mirakle Cream. Adding a final, very personal touch, Natalya commissioned a local artist to customize the Better Skin Mirakle Cream label to mirror the beautiful fabric patterns famous in her home country. Natalya is now a proud US citizen and Better Skin Mirakle Cream is ready to be shared with the world. Better Skin Mirakle Cream is filled with love, history, natural ingredients, a bit of science and a good measure of great karma so that everyone can radiate their best skin ever. For more information about Natalya, please read about her story on the Huffington Post here: http://www.huffingtonpost.com/bri-seeley/the-inspirational-woman-p_7_b_10432322.html. Murphy D. Bishop, II is the co-founder of the Better Skin Company and Founder of of BLEU Brand Development (http://www.bleubranddevelopment.com). With more than 20 years of experience, Mr. Bishop is a highly skilled beauty sales and marketing executive. His career began with the flagship Estee Lauder brand before moving to Bobbi Brown and then Stila, where he worked with original founder, Jeanine Lobel. He went on to work for Victoria Secret Beauty under Robin Burns, served as a National Sales Manager for Bare Escentuals and Molton Brown before joining butter LONDON as the Global Vice President of Sales and Marketing. Most recently, Mr. Bishop spent time as the General Manager of Los Angeles-based boutique cosmetic firm, JOUER and as CEO of Youth Corridor. With strong vender and retailer relationships domestically and internationally, Mr. Bishop prides himself on his ability to develop, grow and manage global beauty businesses.